불설장수멸죄호제동자다라니경은 줄여서 ‘장수경’이라고 부르기도 하는데, 중생들이 부처의 힘을 빌리거나 수행을 통해 자기가 지은 모든 죄악을 없애고 무병장수하는 법에 대한 가르침을 적은 경전이다. 우리나라에서는 고려시대부터 꾸준히 간행되면서 일반인에게 상당한 영향을 끼쳤다. 이 책은 태종 16년(1416)에 첩봉(疊峯)이 주관하여 목판에 새기고 닥종이에 찍어낸 것으로 크기는 세로 24.5㎝, 가로 14.4㎝이다. 책 끝에 있는 첩봉이 쓴 글을 통해, 고려시대에 새긴 목판이 있었으나 오래되어 닳고 갈라져서 다시 판을 새기고 찍어냈음을 알 수 있다. 태조는 법화경, 은중경, 장수경을 널리 세상을 이롭게 하는 경전이라고 밝히고, 이를 널리 펴기 위해 태조 7년에 법화경과 은중경을 먼저 판각하였으며 장수경은 고려시대의 판이 있어 같이 판각하지 않았는데, 오래되어 인쇄상태가 좋지 않아 1416년에 다시 새긴 것이다. 이 책은 고려시대의 판을 다시 새기고 찍어낸 것이지만 조선에서는 가장 오래된 장수경이며, 조선 전기의 불경 간행 경향을 살펴볼 수 있는 자료로 주목된다. Bulseol jangsu myeoljoe hojedongja daranigyeong is a Buddhist scripture about how to secure the divine aid of the Buddha and how to redeem oneself from sins and gain sound health and longevity through practice. 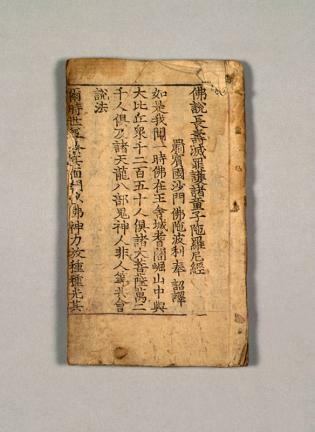 In Korea, this sutra has been continuously published since its first publication in the Goryeo Period, influencing the public greatly. Measuring 24.5 cm long and 14.4 cm wide, this book was printed on mulberry paper with woodblocks carved by Cheopbong in 1416 (16th year of the reign of King Taejong of the Joseon Dynasty). In the epilogue, he said that this book was printed from newly carved woodblocks replacing the damaged ones from Goryeo. Based on the belief that Saddharmapundarika Sutra (Lotus Sutra), Bulseol daebo bumo eunjunggyeong (Sakyamuni’s Teaching on Parental Love), and Bulseol jangsu myeoljoe hojedongja daranigyeong are instructive and beneficial to the general public, King Taejo of Joseon, father of King Taejong, had printing woodblocks carved for the wider distribution of the three sutras. 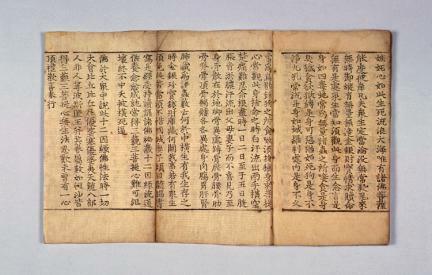 Though this sutra had its original printing woodblocks carved in the Goryeo Period, it was reproduced in 1416 since the woodblocks had been worn down. 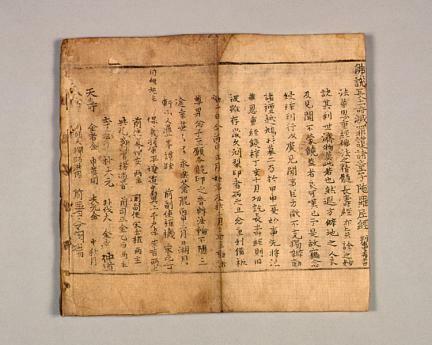 This copy is the oldest of its kind dating back to Joseon, providing much insight into the trend of publication of Buddhist scripture in the early Joseon Period.